I have to admit something. Tonight, not last Friday, is my Christmas Eve. I am so excited about the return of the Bundesliga. It's my little guilty pleasure.With plenty of interesting story lines, this could be an even more interesting campaign than we've seen over the past few years. Note all times are Eastern and TV coverage is subject to change. Friday 2:30 pm (Live on ESPN3.com): Bayern Munich v Wolfsburg. Welcome to the Bundesliga Steve McClaren. The former England manager moved from FC Twente this summer, and is hoping his next stop brings him the same success he had in Holland. The first thing he did was shore up his defense with Arne Friedrich and Simon Kjaer. McClaren also added a little variety to his attack by adding Mario Mandzukic and bringing in Nassim Ben Khalifa, an eighteen year old with some upside. One thing has been made apparent by Louis van Gaal over the course of preseason training: he has learned how to set his team up without Arjen Robben. Bayern Munich also made the decision not to bring anyone in of note. This is a team that will again contend for the treble. 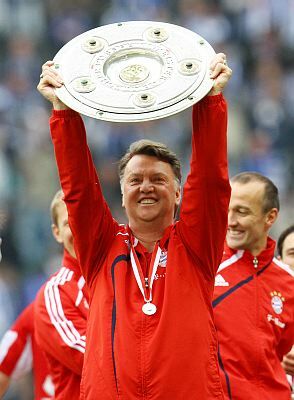 I also think Bayern Munich comes out and reminds everyone why they are firm favorites for the title this year. Prediction: Bayern Munich 3 Wolfsburg 1. Borussia Monchengladbach v Nurnberg: Of all the teams that stayed in the Bundesliga last season, Borussia Monchengladbach gave up the second most goals (60). Nurnberg, on the other hand, scored the fewest goals in the Bundesliga last term (32). I don't expect much out of this one. Gladbach can find goals, I just have no faith Nurnberg has figured out the formula to also find them. Prediction: Borussia Monchengladbach 2 Nurnberg 0. Koln v Kaiserslautern: Kaiserslautern returns to the Bundesliga after spending the last four seasons in the Second Bundesliga. They were also promoted allowing less than a goal a game: that will come in handy this season. Koln, looking to shore up a defense that cost them plenty of points late in matches last season, brought in Andrezinho and Konstantinos Giannoulis to stop that bleeding. I'm calling for a shock here. I think Kaiserslautern will survive this season, and they pick up three points here. Prediction: Koln 0 Kaiserslautern 1. Hannover 96 v Eintracht Frankfurt: Hannover can be forgiven for last season. After tragedy early on, they survived by the skin of their teeth. Eintracht Frankfurt faded badly last season, and haven't done anything to give me the impression that this year will be much different. I think if there's a winner, it will be to the home side. However, I think both will be more than happy to settle for an opening weekend point. Prediction: Hannover 1 Eintracht Frankfurt 1. Freiburg v St. Pauli: I have to be honest, I did not think I'd see the day when St. Pauli would play again in the Bundesliga. When they relegated in 2002, they were such a mess, they were quickly relegated and spent four seasons in Germany's Regionalliga Nord (Germany's third division at that time). However, after scoring 72 goals last season, they have returned. Freiburg only assured their safety late last season. The one thing that should concern any St. Pauli fan is the lack of draws they had last season (4 all season, none on the road). They will have to find a way to get draws on the road this year. This match will be their first lesson, as I think St. Pauli will get a point in their return to the Bundesliga. Prediction: Freiburg 1 St. Pauli 1. TSG Hoffenheim v Werder Bremen (Live on ESPN3.com): Werder Bremen will start life without Mesut Ozil against one of the Bundesliga's better teams at the start of the season. I don't think Bremen's transition will take too long, having picked up Marko Arnautovic in the summer from Twente. With Bremen coming off a positive result in the Champions League qualifier, I think it's also safe to say they shouldn't skip a beat here either. Prediction: Hoffenheim 1 Werder Bremen 3. Saturday 12:30 pm (Live on GolTV): Hamburg v Schalke 04. Draws hurt Hamburg last season, as they saw their hopes of playing in Europe this season dashed. While Schalke finished second last time around, Felix Magath has threatened to quit as manager of the club because of the fan's criticism of his management. Needless to say, this maybe a must watch. I think Magath will see this as the perfect opportunity to shut a few people up, and his squad will do so in style. Prediction: Hamburg 0 Schalke 2. Sunday 9:30 am: Mainz v Stuttgart. Mainz last season produced great results at home, and will be looking to do so this season as well. Stuttgart just missed out on Europe this term by finding ways to turn wins into draws, and draws into losses away from home last season. I'm worried that Mainz will be relegated this season. However, I think that both teams will share the spoils in a dull affair to start the season. Prediction: Mainz 0 Stuttgart 0. Sunday 11:30 am (Live on GolTV): Borussia Dortmund v Bayer Laverkusen. After being undefeated in the Bundesliga for so long last season, Bayer Leverkusen eventually lost, and then forgot how to win. Borussia Dortmund were a surprise entrant into the Europa League this year, turning a string of strong home results into European football. Bayer Leverkusen has welcomed Michael Ballack back to the club, and have also strengthened their defense by bringing in Domagoj Vida. Bayer Leverkusen will contend for the title again this season, while I still wonder what European football will do to Dortmund early on in the league. If Bayern Leverkusen want the title, they have to win more than four games away from the Bay Arena. I think that will start here. Prediction: Borussia Dortmund 0 Bayer Leverkusen 1. That's a good one, Johnathan. Of course you'll have me hooked when you say Bayern Munich are favorites for the title :D ... you know who I am now ofc after those two lines, hehe.